Advent Horizon is a four-piece band hailing from Salt Lake City that combines the old school prog rock with jazz and funk sounds. The band openly admits that the biggest inspiration for them are Canadian prog legends Rush. AH released their second full-length album Stagehound this past spring. The record comes with eleven songs wrapped up in almost a 60-minute tasty package. It opens with “Invasion Theorem,” which in my humble opinion is not the best possible choice for the album’s opening song- they are quite a few of my personal favourites that could get that privilege. The sound of “Motion” is more funky, with guitars applying the warmness in the classic prog rock way. Rylee McDonald’s vocals get a real boost here. “Diary” emphasises the creative energy of the band through the melodic work, smooth singing and straightforwardness what makes it a perfect album opener, but hey enough with whining. The full potential of McDonald’s voice is discovered in “Down the Vine.” The song makes it easy to realise how important McDonald’s vocals are for defining the AH’s sound. “Magic Chef” is the only instrumental track on the album, and it’s pretty mouth watering. What made me think that having an instrumental version of “Stagehound” would be totally new and different listening experience. This song showcases the technical prowess and skills the band has, and that they are comfortable in both standard “singalong” and “instrumedley” settings. Advent Horizon’s songs are challenging and far from being monotonous. Each and every one of the tracks from Stagehound has a personality for itself. “Oceans” changes the tempo making it a more emotional piece, both lyrically and musically. Possibly the best guitar work is provided in “Wilted Grace,” an upbeat piece that comes up with many changes in rhythm. Guitar solo in particular exudes a classic, vintage sound that’s warm enough to melt an iceberg. The last two tracks on Stagehound are the longest pieces, which are setting the pace towards more calm and nostalgic soundscapes. 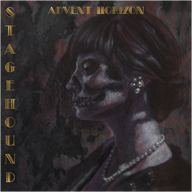 Advent Horizon make good music, and that is what “Stagehound” proves. With added experience on the way, this band can easily turn into the next big thing. Watch out.